Sprinting: Slowing Down to Go Fast? Sprint racing can be a tough balancing act, between tempo, technique, pace, and power application. As the sprint courses have grown in distance and time, not only on an international level but also domestically, controlling your tempo has become more and more crucial to laying down the fastest time of the day. People automatically associate sprint racing with moving everything at top speed to try and maximize speed, however, if you focus more on big powerful movements you will always beat the racer flailing in every direction imaginable. This proves the contradiction: slowing your tempo down to apply big powerful explosive movements will be faster. To the average viewer it will always look like the flailer will be setting land speed records but it will be the smoother skier always coming up with the fastest times. Steinbock Racing's Chris Cook recently won the pack sprint at the American Birkebeiner to finish 3rd. Don't get me wrong though, you can't go through the entire course with the same tempo. The terrain will always dictate what tempo is the fastest. Sprint courses will generally have some steep climbs and some gradual sections. It is on these gradual ups and downs where you can really maximize your speed with tempo. These gradual sections were made for skiing big. By slowing your tempo to maximize the power application of the technique you will maximize your glide and increase your efficiency. If you kept a short quick tempo through the same section, you would have doubled or tripled the number of strokes as the same racer skiing big. Now as the race continues and the gradual section of the course leads into the steeper sections, the slower tempo racer can now shift gears, quicken the tempo, and accelerate up and over the terrain. The higher tempo skier simply has to try and maintain the same high tempo into a section that is much tougher than the previous gradual section often leading to deceleration and fatigue. Every transition in the sprint course terrain can be thought of as a cue for a shift point to dictate a change in your tempo. By continually changing tempo to adapt to the terrain you will be skiing each section efficiently and quickly. Sprint racing is just a much shorter distance race really. 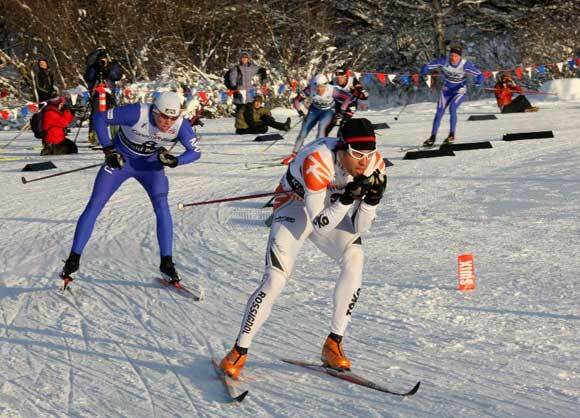 The racer who covers the course with the fewest amount of strides will have skied the most efficiently and covered the most amount of ground in the fastest amount of time, every time. The flailer may look the fastest but wasted movements equal wasted energy, resulting in fatigue, which kills your speed. In a game where you want to reach your max speed and pin it there, you need to ski as efficiently as possible.